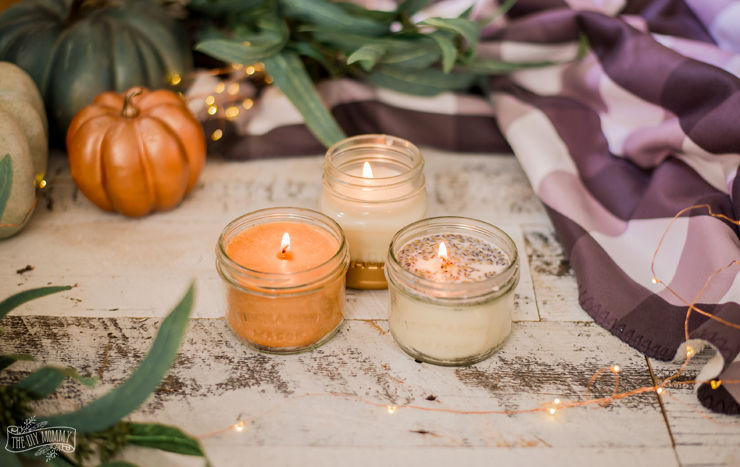 Learn how to make beautiful homemade candles for your home that smell like Fall! This is a very easy DIY that would also make a lovely gift. There’s a chill in the air here, the kids are starting school next week, and even though I thought I wouldn’t be ready, I admit I’m DEFINITELY ready to bust out the cozy blankets and pumpkin everything for Fall! 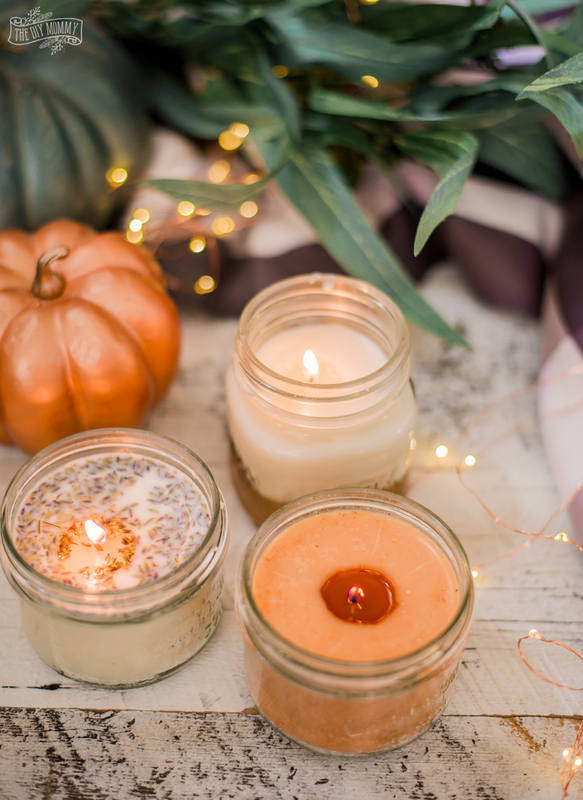 Today, I want to show you how to make some beautiful and lovely scented soy candles that are the perfect decor accessory for Autumn. They’ll give your home that cozy, spicy smell and they look beautiful, too! They’re a very easy DIY project, and they’d also be fun to make with kids. I’m sharing three different ways to scent them – with household spices, with essential oils and with dried flowers – and each way is simple and fun! This project is party of the Fall Seasonal Simplicity series hosted by Krista of The Happy Housie. I’m so excited to be joining dozens of other bloggers in sharing our Fall themed crafts with you today. Make sure to head down to the bottom of this post after you’ve read it to see all of the other beautiful things you can make for Autumn! Make sure to go visit all of your favourite projects, make them, and share them with your friends online! Set up a double boiler (or a DIY double boiler – I use an old milk frothing jug in a saucepan) with water to boil. 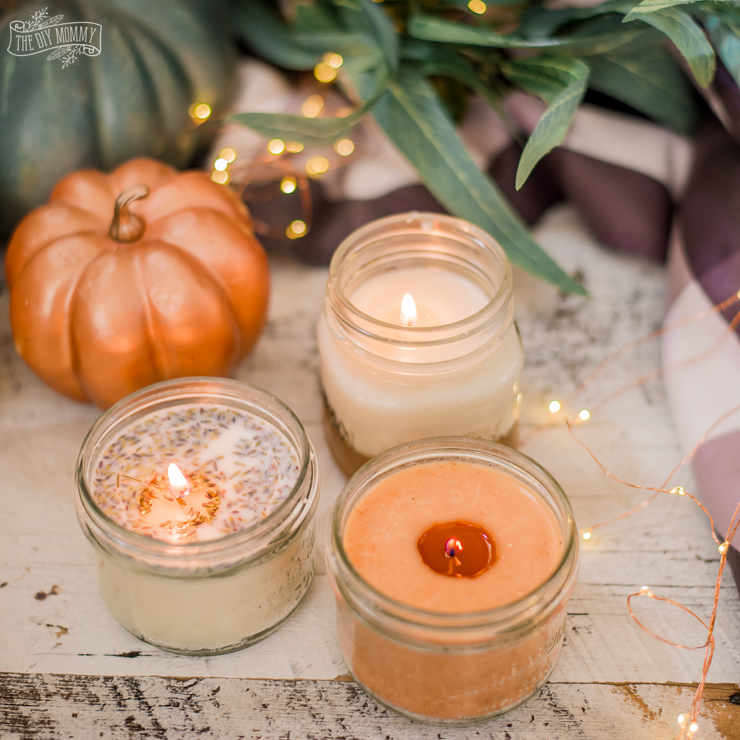 Find some old containers for the candles (I used small wide-mouthed mason jars). Measure twice the amount of soy wax flakes as your container holds into your double boiler. Meanwhile, place or tape a candle wick to the bottom center of your container. Pour the scented wax into your candle container. Let the candles cool for 4 hours or overnight. Place them in the fridge if they’re in mason jars for faster setting. « 6 Things I Always Buy At Costco & the Grand Opening of Costco’s 100th Store in Canada! I bet these smell amazing! What a fun project! They’re so fun to make! Love those! Definitely need to try that pumpkin spice one especially! These are awesome, Christina! Thanks for the tutorial, and glad you could join in on this hop! This post just makes me feel warm all over. Definitely need to jump on the candle making train! These are so pretty and I imagine they smell gorgeous!! Love the colors for Fall too! These look so easy! I will definitely try these! I’ve been wanting some candles for luxurious bubble baths, so this is perfect! One of the white candles has a brown layer? Did the spices sink to the bottom? Any ideas on a way to keep them mixed? Hi, Christina! I never thought that DIY candles can be this easy. I am doing this today and I am planning to use this for Christmas. I love the colors and I think it will look awesome on my desk. I love candles on my desk while working. It helps me keep focused on my work. Thanks for this. Xoxo.